Howard’s prints explore the notion of time and landscape through a contemplative exploration of surface. The sources of Howard’s prints can come from working in the open air or expressing landscape filtered through memory. The physicality of her approach to the printing process makes the subject spontaneous and vibrant whilst capturing an intimate connection with the landscape. Howard is captivated by the ancient semi-natural landscapes typical of her native west Cornwall where a blurred line exists between nature and human activity. Recent works of the Fens focus on the meeting point of land, horizon and sky, their flatness altering the perception of distance. Howard’s work has gradually evolved from her monochromatic studies by introducing colour to reflect the Fens’ ever changing mood and light. She draws inspiration from sites which have a particular sense of place; the catalyst for her most significant pieces of work. 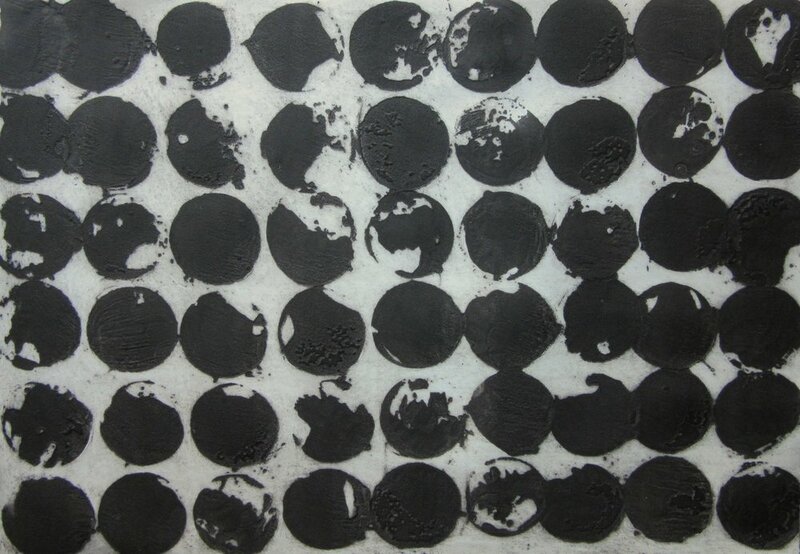 Her plates are predominantly carborundum, a technique where a mix of a binder and carborundum grit is applied onto the surface of a plate and inked up. It provides highly embossed, velvety textures and rich, dense tones. This medium allows the freedom to work on a large scale in the same way as approaching painting. To contrast the carborundum, drypoint is added to produce an incised line, characteristically thin, linear and precise. Colour is introduced by layering carborundum plates or more often realised though monoprint. She prints to the edge of the paper to leave the composition as unconstrained as the landscapes from which she seeks inspiration. Howard was a student at Falmouth and Winchester Schools of Art, was selected for the Design Enterprise Programme at The Royal College of Art and was awarded an MA in Fine Art Printmaking at Cambridge School of Art in 2009. In 2012 she was awarded the Curwen Studio prize at the Royal Society of Painter Printmakers Summer Exhibition. Her prints Goonhilly Downs and White Downs State III were selected for the Royal Academy Summer Exhibitions in 2015 and 2016 respectively. The plate is made by adding carborundum and drypoint to the surface which is then sealed ready for printing. Next, the plate is inked up using etching ink and plate oil, scrim is used to wipe away excess ink. A heavy weight printmaking paper with a high cotton content is torn to size, soaked in a water bath and blotted dry before being placed on top of the plate. The paper is lightly smaller than the plate size and is put through an etching press under a lot of pressure protected by tissue and wool blankets. Once the print has been dried between tissue and boards the monoprint is added over several layers. This is achieved by inking up a separate plate using a range of colours, placing the carborundum print on top and putting it through the etching press again. Subsequent layers of monoprint are added by repeating the process until the print is finished. The works illustrated below are intended to give you a taste of what the gallery has to offer, please email us on info@cambridgegallery.co.uk or call us on 01223 324222 to find out which pieces are currently available. Prices range from £60 - £850.